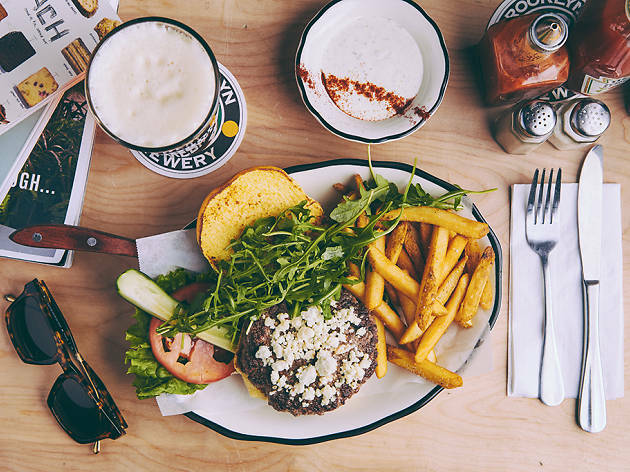 Burgers, shakes, craft beer. Is there anything else a tried-and-true New York foodie needs? Black Tap in Soho channels a classic American luncheonette and gives it a New York twist, meaning it has an edge. 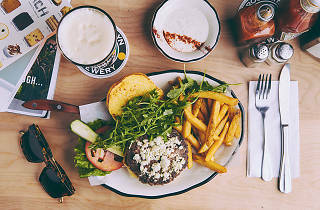 The décor is old-school hip-hop and rock & roll, and the food is anything but boring: burgers made of beef, bison, lamb, turkey, chorizo, and falafel, and sides that include Teriyaki Broccoli, Crispy Brussels Sprouts, and Mexican Avocado. Their signature “Crazy Shakes” have been well-sought after with names like The Cotton Candy Shake, Sour Power, Sweet n Salty, and The Cookie Shake. If you want to experience the ultimate milkshake, look no further. But be warned, Black Tap shakes are not for the faint of heart. Also, you might want to cancel any meals you had planned for the day or for the day after for that matter. Black Tap takes milkshakes to the next level: it’s not just about mixing ice cream with peanut butter and chocolate syrup in a huge cup, the twist comes in the toppings. The glass itself is covered in chocolate buttons, you also find pieces of Reese’s peanut butter cups on top, along with whipped cream, M&Ms and, depending on your shake of choice, even cotton candy and entire lollipops. It’s definitely an experience but most likely one you won’t want to have more than once. Also while the milkshakes are quite impressive, there are most definitely better desserts out there with less of an impact on your calorie intake and a nicer effect on your palette. If you want a very cool but over priced instagram opportunity then this is definitely the place! I found the food to be way too salty and nothing special in the way of taste, even my caesar salad was salty! The milkshakes are super cool but more other stuff than milkshake. While we were very lucky to get in quick, you can usually find yourself waiting in line for 30 minutes or more. It was a fun experience but I think I'll stick to Shake Shack. The food is very, very unhealthy. But you should try their famous huge milkshakes, between two diets! They are legendary!